Through March, we’ve seen two well-publicized celebrations of freedom, though the architecture of freedom has been little discussed. CNN’s Freedom Week featured clips of people, many of them famous, describing what freedom means to them. More global was International Women’s Day, marking women’s gains in freedom and achievement across much of the planet. Achievement depends on freedom and, with freedom, women’s achievements become inevitable. But these celebrations seldom mention one of the most fundamental freedoms; economic freedom—the ability of individuals to make their own economic decisions, without government or crony capitalist control or dependence. Economic freedom has been key to women’s advance, opening many doors, including the ability to make their own career decisions and enter into once virtually forbidden professions such as engineering. Antony Davies, Duquesne University, and James R. Harrigan, of Strata, a Utah-based think-tank, have found a strong relationship between economic freedom, as measured by the Fraser Institute economic freedom index, and gender equality, as measured by the United Nations Development Programme. Economic freedom has been shown to be correlated with a number of outcomes for women, for example, literacy, which increases for both men and women in economically free nations, but most dramatically for women. In the quarter freest countries, women’s literacy is 92 per cent and men’s 95 per cent. In the least free nations, women’s literacy is 60 per cent, a huge gap below men’s literacy at 75 per cent, using data from the World Development Indicators. We at the Fraser Institute have just made a huge advance. Many countries do not extend the same economic liberties to women as to men. In the past, data were not available to measure the difference adequately. Data availability now enables us to adjust the economic freedom index to take this into account. In the 2016 report, Rosemarie Fike explored the adjustment methodology, which will be fully incorporated into the 2017 report. 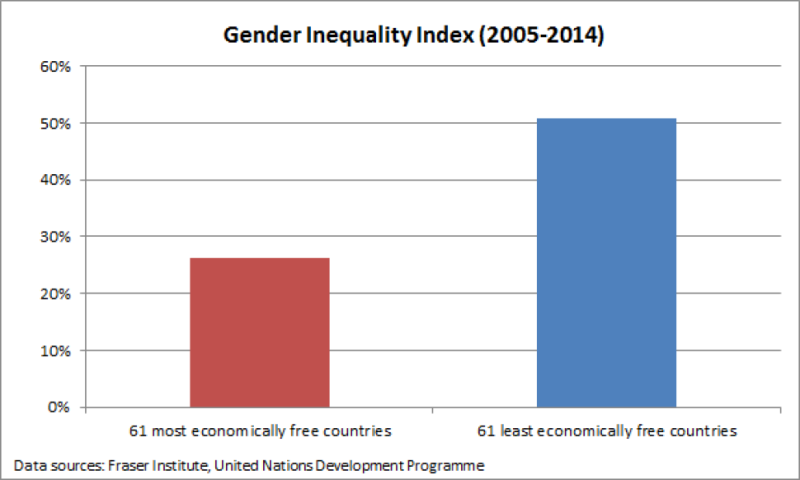 And here too, the positive relation between economic freedom and gains in gender inequality still holds. The adjustment technic penalizes the score of countries lacking economic freedom for women. The penalty is not based on subjective judgments but rather from data from the OECD and World Bank, The downward adjustment for the quarter least free nations is two-and-a-half times the adjustment for the freest nations. Economic freedom is important for everyone. It provides the foundation on which the architecture for freedom is built. In an economically unfree society, government or crony capitalists have plenty of coercive tools, influencing an individual’s ability to find a job, get a promotion, gain education, feed and clothe their families, and see opportunity for their children. Of course, few states have been this extreme, but the more control government or crony elites have over an individual’s economic life, the greater the individual’s dependence. Economic freedom liberates individuals from this dependence and opens the door for other freedoms.